In January 2012, the American Legion Starr Sutherland, Jr. Post 227 in Shoreline initiated a new program to serve the community. They called it the Life Changer Award program. Since 2012, the award has been offered annually. Each year, nominations are due by May 1. Then a committee of Post 227 members selects the winner. In an award ceremony conducted at post headquarters, the winner receives a framed certificate signed by the post commander and a $200 gift certificate to dine at the Sky City Restaurant atop the Seattle Space Needle. while Past Commander Tom Drapac looks on. The first winner was Mrs. Lea Coats, wife of an Everett Police officer. Her nomination came after the marriage of a young couple with three children was in danger of breaking up due to the death of the wife’s father and severe illness of her husband. Despite having four children of her own and being pregnant with her fifth child, Lea provided sustained, wise counsel that enabled the young couple to weather the storm and stay together. Lea was recognized at a luau held at post headquarters in August, 2012.
winner Bill Briggs, Sr. and Bill’s friend, Ken Hubbard. Bill Briggs, Sr., of Kenmore, won the Life Changer award in 2013. Over a 40-year period, Bill enabled several thousand kids with physical disabilities to attend Camp Casey, a week-long summer camp, free of charge. At different times, he served as Camp Casey cook, counselor, director, fund raiser and benefactor. He did this as a member of the North Central Seattle Kiwanis club, the Camp Casey sponsor. Bill was unable to attend the award ceremony due to illness but he asked his friend, WWII navy veteran Ken Hubbard, to stand in for him. Later, post member Carroll Goering accompanied Ken to Bill’s home to present the award to him. 2014 Life Changer award to Barbara Williams. In 2014, the Life Changer award was won by Lake Forest Park resident Barbara Williams, who has spent much of her life serving children with disabilities. 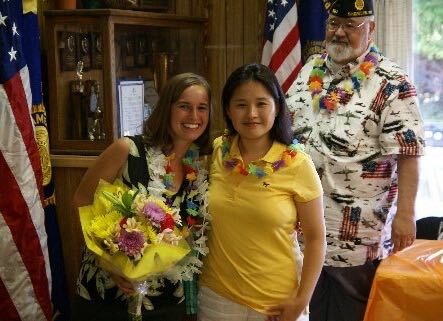 As a high school student, she served as a counselor for Kiwanis Camp Casey, a free one-week camp held on Whidbey Island each summer for children with physical disabilities. Later she served as a therapist in the public schools. 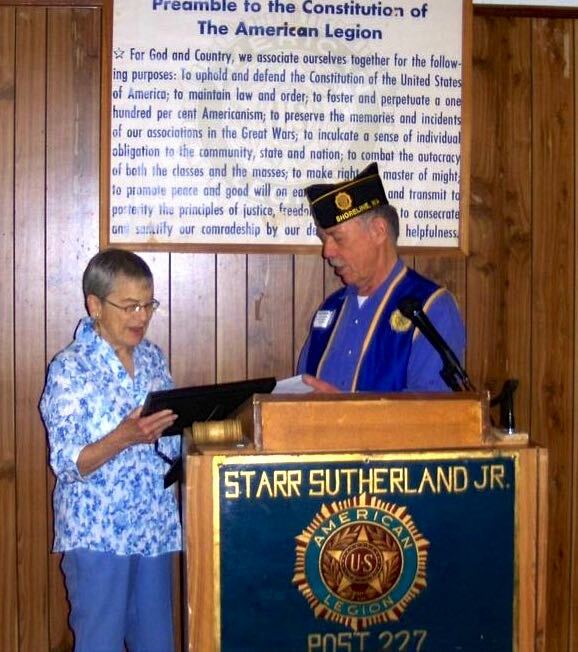 After retirement, she became the volunteer director of the Kiwanis Camp Casey program. She is the main driver in raising the $50,000 in funding needed annually and in all other aspects of putting on the camp. 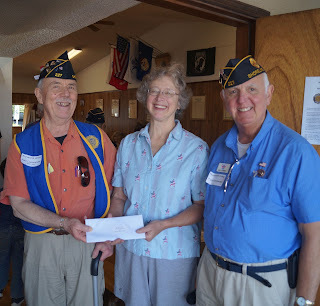 Barbara and her husband Paul attended the September 2, 2014 meeting of Post 227, where post commander Shane Freund presented her with the award. a Life Changer Award to Virginia Harvey. In 2015, the Life Changer Award was won by Seattle resident Virginia Harvey. She served as a volunteer at Veterans Hospital twice weekly for more than 15 years, traveling there by Seattle Transit. In addition to delivering blood and other tasks, she moved ailing veterans throughout the hospital in their wheelchairs. She certainly made life better for many ailing veterans. 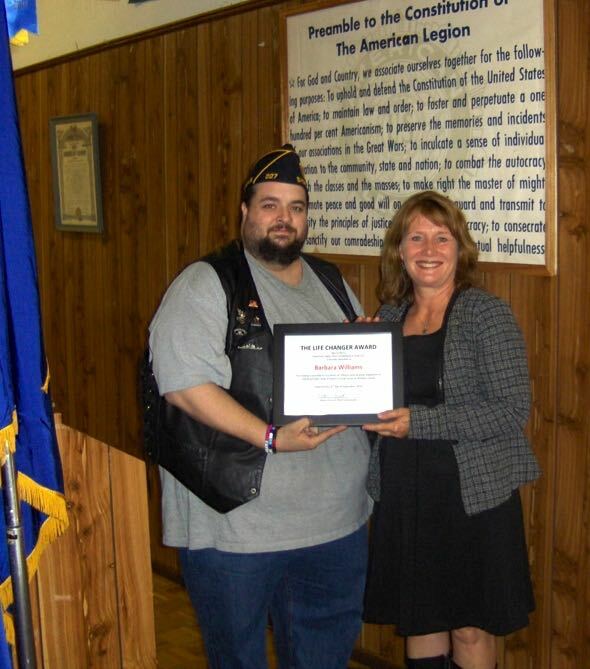 Post 227 Commander Richard White presented the Life Changer award to Virginia at the September 1, 2015 meeting of the post. Life Changer Award to Kim and Brad Lancaster. Shoreline residents Kim and Brad Lancaster received the Life Changer Award in 2016. In the fall of 2015, a group of homeless people were desperate. They had been living in tents by a Shoreline church when the property was sold. The group, including families with children, had nowhere to go. That’s when Kim and Brad invited the homeless group to camp in their backyard. They also offered the group the use of their kitchen, bathroom and laundry facilities. Four months later, these homeless people were able to get on their feet and acquire housing. Kim and Brad certainly made life better by opening their hearts and home to these homeless folks. 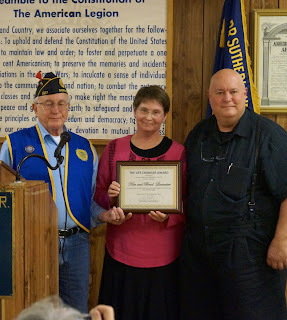 Post Chaplain Larry Fischer presented the Life Changer Award to the Lancasters at the September 6 meeting of the post. Ray Coffey presenting the Life Changer Award to Leah Setala. Leah Setala won the Life Changer award in 2017. As a music and band teacher at St. Luke School in Shoreline, Leah goes the extra mile to help children learn to play and enjoy music. When families find that band instruments are beyond their means, Leah helps them acquire used instruments. Those families love hearing their children play music but know none of it would have been possible without Leah. In their spare time, Leah and her husband acquire furniture and other household items at rummage sales and yard sales. They recondition items needing repair. Then they donate them to the needy at St. Francis House in downtown Seattle. By helping children to play and enjoy music and by helping the needy, Leah made a positive difference in the lives of others. 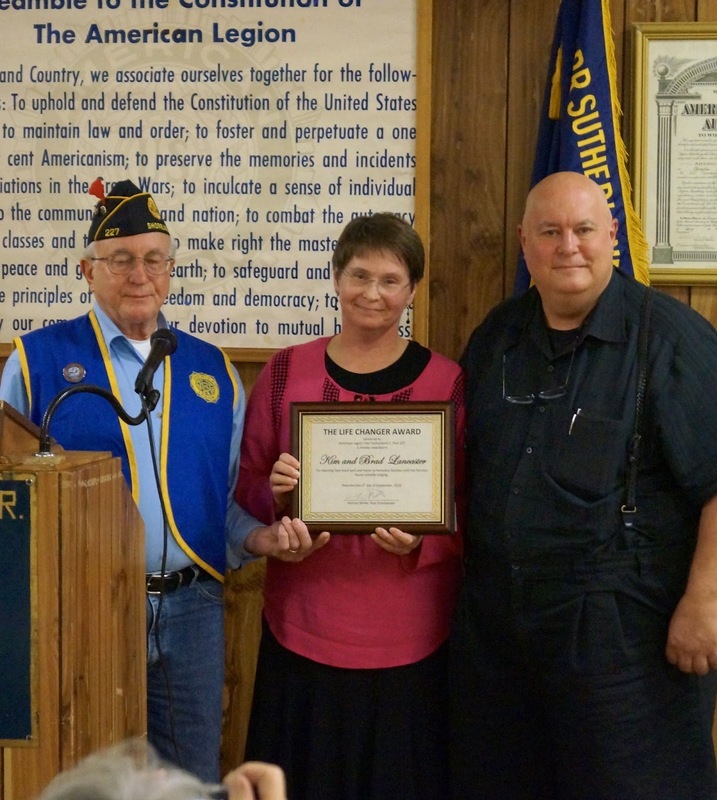 She received the Life Changer Award at the July 15 BBQ of Post 227. Post 227 is grateful to the persons who took the time to nominate candidates for the Life Changer award. Special congratulations are due to the following people who submitted winning nominations: He Youn Lee nominated the 2012 winner, Lea Coats. Ray Walters nominated the 2013 winner, Bill Briggs, Sr. Mike Servais nominated Barbara Williams, the 2014 winner. The 2015 winner, Virginia Harvey, was nominated by Joyce Crandall. Bettelinn Krizek Brown and Linda Stein nominated the 2016 winners, Kim and Brad Bradford. Bob Grasmick nominated the 2017 winner, Leah Setala. 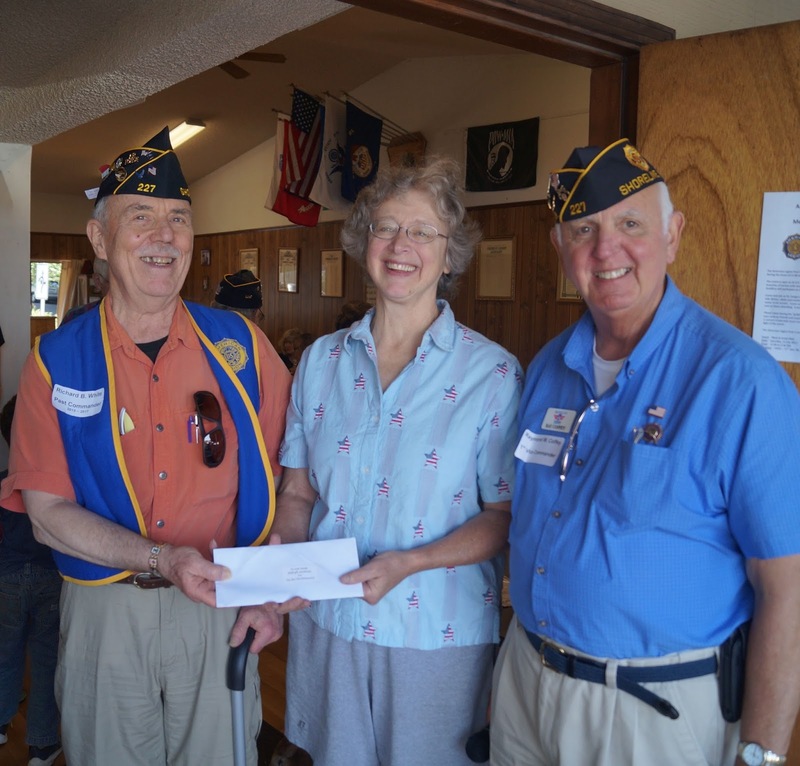 Post 227 hopes to continue offering the Life Changer award annually as long as members of the community continue to nominate worthy candidates. A flyer announcing the 2018 competition will be coming soon. Watch for it in the Shoreline Area News.